At the turn of the century, Andrea Pirlo, the bright young hope of Italian football, led the Italian under-21 team to European glory. Playing behind the strikers as a “trequartista”, Pirlo was one of the best players of the tournament, contributing with a number of assists and goals. His exploits as captain, didn’t fail to go unnoticed as managers across Italy earmarked him as the next great no.10 to don the blue of Italy. Life was seemingly nice and sunny for young Andrea; he completed a dream move to Inter Milan but in three years at the club, he failed to make the breakthrough. Because ahead of him, competing in the same position, he found the celestial Roberto Baggio – one of the finest playmakers all time – and as a result, Pirlo was loaned back out to his first club, Brescia. Twelve years later and Andrea Pirlo is considered as one of the greatest players of his generation. In his position as the deep-lying playmaker (or base playmaker as Mazzone likes to call it), he is almost peerless, performing the role in a way that must be considered unique in the modern game. But what is it precisely that he does which makes him the supreme playmaker right now? Below, Karthik Venkatesh (KV) tries to decipher the “Andrea Pirlo Code”. Pirlo finds a way out when he is pressed: When being closed down, if he is unable to create space for himself or his teammates through dribbling, he uses the short pass wisely and chooses the safest pass. Being the key player in the team’s midfield, he often attracts more than one opponent and he immediately finds a free player close by. He doesn’t retard the flow and keeps the ball circulation going. But beware, Pirlo sacrifices a marginal drop in passing percentage to try and attempt adventurous passes over the top. That is probably the greatest difference between Pirlo and the other deep-midfielders. (Pirlo has completed 354 of his 459 attempted passes (77%), and has a forward passing accuracy of 76%). The long ball is his deadliest weapon: Once he finds space even for a split second, he is lethal and doesn’t miss the opportunity to use the long ball to set up one-on-one situations for the striker. He is probably the quickest in the world to spot a run from his teammates. Against England, Pirlo attempted a staggering 30 long balls! Assists the assister: Other than having the highest number of assists in Serie A, Pirlo will most probably also have the highest number of ‘pass before an assist.’ He is always on the look-out for the pass that will empower his teammates and lead to a goal. Chance creator: Andrea Pirlo is a high C.Q.I chance creator. His pass to Balotelli against England was one of the highest we have ever recorded. Goal scorer: One must not forget that Pirlo is a high caliber free kick taker and he also has a great shot that can beat the best of keepers. How do you stop Andrea Pirlo? To completely isolate and nullify Pirlo’s impact is close to impossible. But what can be done is mark him closely and deny him the space to exert his game. 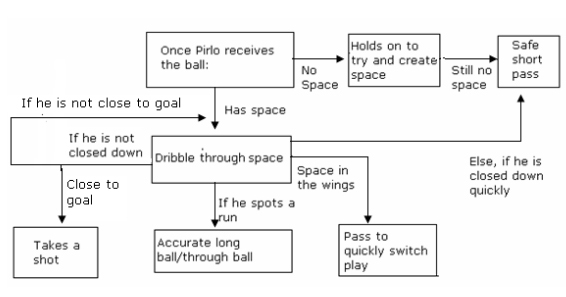 As you can see from the flow chart, you can limit him to safe short passes by restricting the amount of space he gets (like how Park Ji Sung did for Manchester United in their 4-0 win in 2010), but he will still hurt you by quickly circulating the ball and getting it to players further forward. Pirlo has his downsides too. He’s not so physical built as modern footballers are these days so there is an incline that he can be pushed aside by far stronger teams. Nevertheless, he almost always negates this with an amazing balance and ability to shield away multiple opponents at once off the ball (at times, bordering on nonchalance). Pirlo’s defensive contribution in terms of tackles and interceptions is modest at best, but one must take into account that he is shrewd when it comes to positioning and does a great job just by occupying the space in front of defenders. Against Spain in the final, Pirlo will obviously see far less of the ball, but he will be a dangerous threat on the counter with his ability to hit long passes behind Spain’s high line. Perhaps the best chance of negating Pirlo is not to focus on him individually but to try and disrupt the team’s fluency, hence breaking up his effectiveness. Spain are probably the best at doing this as they hound the opposition once they lose the ball and often Pirlo is the one who receives it first. But it’s their brilliant defensive shape which doesn’t get the attention it deserves because through the use of through-marking to aid their pressing, they are fantastic at stopping opponents find their man. 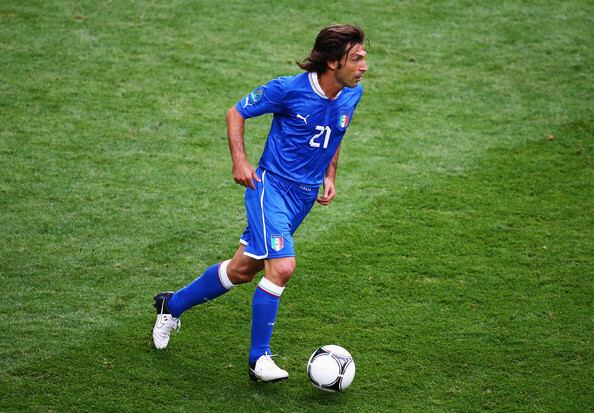 Why don’t more teams use a Pirlo-esque player in deep-midfield? There aren’t many players in the world who have the skill set that Andrea Pirlo possesses. To use those skills in a deep position and still exert total control over the game requires a great understanding of the role and few players can match him in that regard. Xabi Alonso and Paul Scholes spring to mind, but they have far fewer assists when compared to Pirlo and they are more of instigators, whereas Pirlo is well and truly the playmaker of the team. Another caveat is that, Pirlo usually requires players like Marchisio, Arturo Vidal and De Rossi (who has been splendid this tournament, possibly Italy’s second most important player) to do the defensive job and offer drive higher up the pitch. Pirlo is only as good as his midfield partners. (To add to that, Italy use a “magic square” formation in the middle which is exclusive to specific midfield functions. As Michael Cox notes, the player who is expected to be the “trequartista”, Ricardo Montolivio, is not and is asked by Cesare Prandelli to get back to make an extra central midfielder in defence). At Arsenal, we have many players who can perform that role. Denilson, once described by Le Boss as a cross between Tomáš Rosický and Gilberto Silva is talented enough to play that role. Besides being suspect in his positioning, he has a long way to go as he doesn’t quite have the vision and long passing required to be the playmaker of the team. Mikel Arteta has proven to be one of the best midfielders of the season and Alex Song has shown that he too is more than capable of doing the job, with his dribbling, and who can forget those exquisite chipped passes over the top for Robin van Persie. But the best bet is our very own ‘Spanish’ player, Jack Wilshere who possesses all the required attributes like vision, technique, passing, positioning and quick decision making to succeed in that role. But is it an intelligent decision to not use his skills higher up the pitch? Probably not, but he is the closest Arsenal can get to Andrea Pirlo, the most stylish and yet, the most important player in the world.